Book dilemma: purchase or borrow? I love books. I’m an avid reader and sometime collector of books. OK, probably more than just “sometime.” I work in a library and have ready access to thousands of books. I hold a library card for Wichita libraries where I have access to thousands more books. So why is it that I feel compelled to purchase books? My bookshelves are filled with hundreds of books. Many of them haven’t yet been read. I tell myself I will read them before I buy any new ones, but then I find three more books I “need” to own. And don’t even start me on the used-book sales at local libraries! 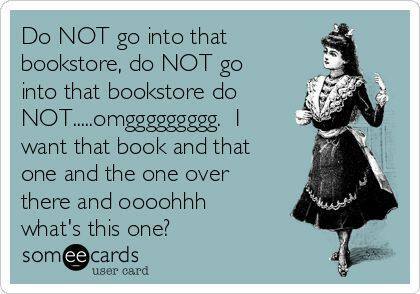 It’s easy to make the decision to buy some books. For instance, Nancy Drew. I loved reading them as a kid and I love reading them as an adult. So, I have a shelf full of them. And I have my favorite authors, whose books it’s easy to know I am going to love. Then there’s the classics that I love to read and want to own copies of. These include The Count of Monte Cristo, Pride and Prejudice, and most of Agatha Christie’s titles, among others. Sometimes I have to own multiple copies of the same book. Namely, Harry Potter. Yes, I own a set of first editions in hardcover from when my kids were younger and we were all reading them. They’re actually my second set, because I gave my first set to my most Harry Potter-loving kid. Then the illustrated editions began to be released, and they are so beautiful, so I needed them. With the 20th anniversary of the release of the first book last year, new editions in house colors were released, and of course I had to start my collection of Hufflepuff house books. So, how do you decide which books you want to buy and what titles you’ll borrow from a library? I’d love to know how you make those decisions. If you’ll share in the comments, I’d love to do a future blog post about your answers.